This places our players against the opponent that they are actually to cover. Wings are in a position where they can go directly to challenge opponents points without obstruction. If we win, move to positions to set up breakout on weak side. Notice LW going to half boards. RW or RD has initial responsibility to recover puck. LD moves to where she can receive a pass behind net. If Opponent wins draw, LW and RW go straight to the point men. C, LD and RD are already engaged with their assigned players. 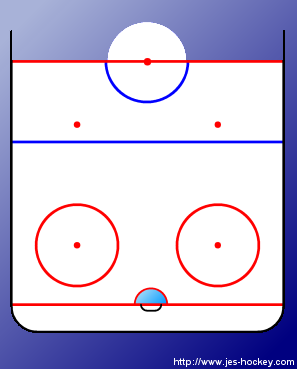 Defensive zone setup on Left side.